Please note: this is something of a report on work in progress, only bordering on a readable long article. It's meant more to skim, to inspire more researchers to look into it, as a reference and shortcut for them, and - most importantly - to help the general public (those who can follow, and care enough) to think outside the box here. A lot is covered below, from basics to detailed observations and thought exercises. Not every point does much to challenge "Caesar" narrative, but each one matters in considering the whole. Here is where I will analyze the number system used in the massive catalog of morgue photos presented by the Syrian defector "Caesar," the alleged meaning behind each number, and some consideration of other possible meanings. According to the partisan defector, all of the 55,000 photos he smuggled out after fleeing in mid-late August, 2013, show killed detainees of the "Assad regime," with all other kinds of deaths in the Damascus area during the conflict apparently documented somewhere else. were However, as I've previously addressed (see The Other Half of the Caesar Photos), there was a late revelation that almost half of the touted 55,000 images actually showed victims and effects of opposition violence or, at least, something other than detainee deaths. The remaining half, as accepted by Human Rights Watch, suggested close to 7,000 prisoners of the state security system, when it was said to be over 11,000. As it turns out after some study, the photos touted as that seem to show nearly 7,000 people who mainly seem to me like clear mid-to-long-term detainees of someone. Also as claimed, the number system implies even more passed through - perhaps just over 11,000 suggested. This is a coincidence (or is it?) The previous 11,000 claim was based on different and flawed reasoning by Carter-Ruck and/or their sources (see the link above for that part and see below for the new stuff.) But a number of interesting points emerge, especially as we consider what the numbers mean. So 215 looks like CIO, and 227 like CCV. That's because, while Arab writing reads right-to-left, number blocks read left-to-right like Westerners do it. I'm not sure how unusual it is to use this more archaic number system. It seems odd, but might be standard and used already (see below: Previous Example: Deraa). Here's how the system is used on the index cards seen in the photos (at right). As all sources pretty much agree and analysis seems to bear out, they put branch victim and branch number at the top, and a hospital 601 processing number below (due to reading order, I put the /b at the end like they do - it's a suffix, not prefix). Here, notice an unusual thing; the person first wrote for hospital # 4924/b, and covered the 9 with a bolder 6. This might suggest (truthfully or not) that the writer normally used the Persian variant number system (compare here - their 6 is more similar to a 9). Or they just thought 9. This victim 227-2615, by the way, is the one tattoo-identifiable Christian I can point to in the photo catalog. What better time (aside from when you've killed a Shia or Alawi) to trot out hints that Iranians did it? That's all highly speculative. "Caesar" could have just forgot where he was, and numbered this one ... off by exactly 300? How do you do that when you're deep in 4600s, just did 4622, and suddenly think this one's 4923? Hm... that's fairly possible. But it's one of the smaller mysteries discovered so far. The branch number often appears on the victim's forehead, written on the skin directly or on a piece of tape. Both this and the hospital number are often written on their chests or bodies. All seem to use the same system and tend to match up. 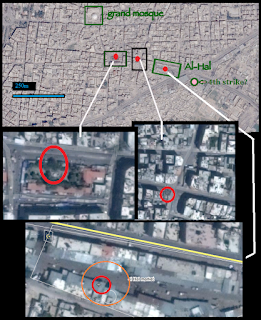 * Branch number: - the designation of the branch of Syrian military intelligence responsible for this body, allegedly. (see list below under "branch number means what?") The common understanding is that branch held the man prisoner, tortured him, and in the end killed him. But this is open to question (see same section). * Branch victim #: Aside from the first 999 victims, the top number is usually 4 digits long, resting on the bar over branch number. Just what this represents and how it progresses is disputed, and discussed below ("branch victim#: for prisoners or corpses?"). The Whole System: What's Confirmed and What's in Question? 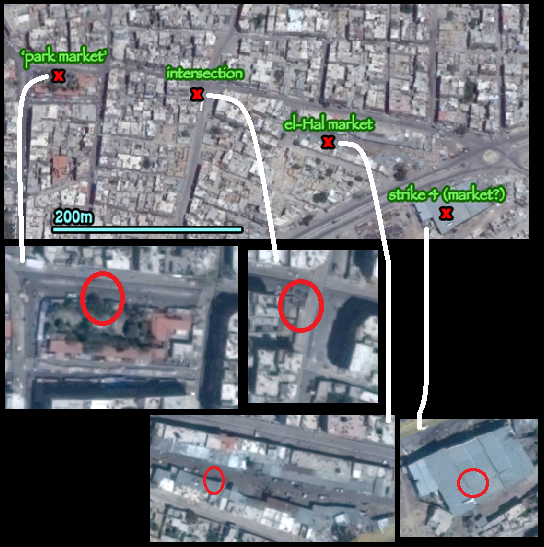 * At least several group shots, and likely a vast majority of all photos, were taken at the garage behind military hospital 601 in Damascus, and/or in a hospital setting taken as 601 or one affiliated. (Tishreen military hospital is mentioned). Apparently, this is still a controversial point to some people, but it shouldn't be. 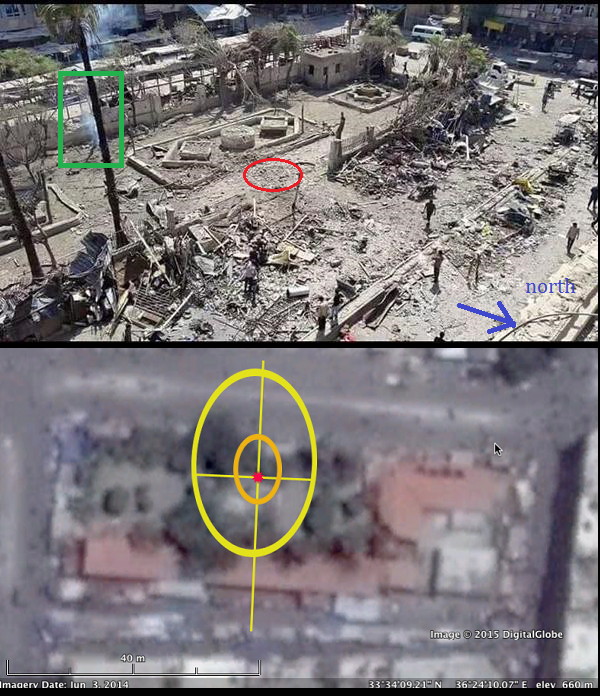 See HRW report for graphic explanation, or here at ACLOS, where it's noted Bellingcat also got it right. Well inside the secured core of the capitol and just down the hill from president Assad's home, this is an official place, and these should be official procedures.It's still possible many or even most photos were actually taken somewhere else and slipped in, but I'm not proceeding on that idea. * The SAFMCD database includes 6,850 photos, mainly face shots. This minus exceptions (several duplicates at least, one tattoo shot, one blank card, etc.) probably is just about the estimated numbers cited. HRW has 6,786 detainees, and the book by Garance Le Caisne reached a count of 6,627. Both sound close to what I'd guess. I'm liking the low one at the moment, but will use a rounded-off middle number of 6,700 as shorthand. * The SAFMCD decided the hospital number (bottom #) rises to 5,000 (or 4,999? ), then switches to restart at 1 but with a suffix - the Arabic letter for b. (I presume that's what they decided, as it seems right - HRW tried to explain it but it came out mangled - see here). I don't know how logical that is. They would most logically use the whole ten digits before re-starting, but whatever the reason, I can see numbers ticking up to near 5,000 (highest seen: 4887), then starting low with a /ب . That's the second letter in their alphabet, like in ours with "b" sound (and the first letter is their "a," but from there it's different). The lowest I've noted is 357/b. And we can see it again climbing to close to 5,000 (highest seen - 4994/b). (See ACLOS table, 2nd column, continues across all boxes, all branches, all victims, and very far from complete). At right, from an image linked in the SNHR report, is a man spitting blood despite no visible injury. He's also been moderately starved, and suffered burns or irritation to the skin of his shoulders, neck, and perhaps his eyes. On the card, on his shoulder, and on his forehead but now covered in blood, is "detainee" number 215-1289. On the card also is hospital number 4833. That's near the switch to /b numbers, so he should be in the massive folder 3-2013, where that switch happens. * Considering that implication raises a problem; if about 6,700 faces are shown in the given span, while the body numbers in the same span suggest 11,000 or so passed through ... this means roughly 4,300 of the bodies - about 40% of them - are missing somewhere in the sequence. This could have a totally innocent explanation, and the missing views could be just more of the same. Maybe those were on Caesar's days off? A fuller number sampling will argue for or against that. But so far it seems some single entries are missing between ones inlcluded. If that's the case widely enough, it suggests a massive filetering of the images to create a certain effect. What's missing? Natural deaths? Foreign terrorists killed in action? Pro-government militants? Identifiable pro-government civilians? Massacred women and girls? Or is it just more of the same 100% tortured detainees? 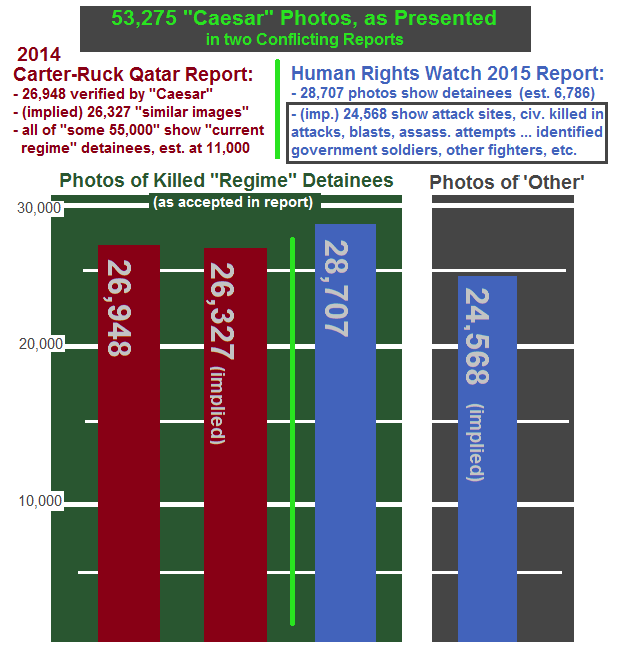 Human Rights Watch heard "Caesar" explain he only gathered photos when it seemed safe, and apparently some weren't available at those times. That could be, but precedent says when "Caesar" cites safety concerns, he means truth concerns. The photos he didn't include were likely those he feared would damage his story - worse than the ones he did include. Despite these technical points seeming to pan out, I'm still not convinced the numbers seen represent a real "regime" system, although it would likely resemble the official system. It could well be the real deal, but the possibilities merit more scrutiny before deciding that. And more importantly, if it is official, the question of just what they're tallying here also deserves more thought and less credulity. The top 4 are responsible for well over 90% of the photos/victims. Two of these (patrols, raids) sound clearly mobile. I'm not sure what zone means, but it might be mobile. I don't know if AF Intel has a mobile unit, or any of the other branches. But it might be that these are the people called when a pile of emaciated corpses appears, for example, at the edge of a rebel-held town or district where the local terrorists just ditched that many unneeded hostages. Furthermore, there are other reasons military intelligence might hold bodies that other parties had collected. They might, for example, want to document what the terrorists they're up against do to people, maybe with an eye to court cases against those found responsible. Otherwise, it's possible "Caesar" and/or collaborators controlling the site managed to re-brand bodies brought in. They could have done this with the upper numbers made up and written in - and kept track of - blaming a systemic range of security agencies, when really they were only tasked with the the hospital number. Consider: by this spread, branches with apparent reason to interrogate people - the one reasonable if wrong use for torture - seem to be doing very little of it (fatally anyway). Military investigation and military police branches have only 100 dead between them. Is that realistic, or a way of clarifying that this torture was mainly not about getting information? Like "Caesar" suggests at every turn, it must be about pointless, villainous, regime-change-justifying cruelty. And then of course it's possible, and well-enough covered elsewhere, that "Caesar" and the others are correct. We're in the business of considering all possibilities here, right? Not that this is the most representative example, but it's an example. At right, by the card and body numbers is branch victim #j/9227, hospital # 2441/b, (with a little difficulty again in the hundreds, different ink colors, confusing errors here...). Military intelligence allegedly killed this apparent NDF fighter (aka "Shabih"), maybe for "refusing orders." He has Assad tattoos, a spiderweb on the shoulder, bearded but neat, and strong - not starved or anything, this one. He was shot in the side by a large caliber round, perhaps by a sniper. Somehow, I suspect, he became unidentified, maybe dumped far from the kill spot, and that's why, for now, he's only identified with a number. "Caesar" would say he's another coded state secret that wound up here. Here's his SAFMCD tortured detainee entry: photo original name j-9227-4-6-2013 (5) (note: I think the 5 suggests there are 5 photos of this guy, or this is #5 of however many - a bit higher than the average seen (2 or 3), which might mean extra views ... to document tattoos, for example). But again I emphasize, this inclusion of apparent fighters doesn't seem to be the norm. Most of those will be identified, and it seems most don't pass through here. And there's more likely to be a good number of unknown rebel fighters (foreign and domestic) included. While such inclusions challenge the simple "Caesar" story and should be noted, the majority of photos - at least 80% - seem like hated and abused detainees. They may have been fighters once, but didn't spend their last days or die that way. Starved, tortured, eyes gouged out or damaged, and many apparently gassed to death * - these men were generally treated too poorly to be anything but prisoners. And again I emphasize - they seem like prisoners of someone. Branch Victim #: for Prisoners or Corpses? Important question: Is the top number the victim's identifier when alive, or is it only assigned after death? The SNHR's report calls this this the victim's "number in the security branch (before his death)," presumably set by arrest or arrival date. Only the bottom number is post-death, and issued in that order. However, as far as I've seen, branch victim numbers consistently tick up along with the hospital numbers, each one at its own varying speed. And group shots tend to show consecutive and close numbers dying at the same time. We see victims 2348, 2350, and 2355 from branch 215 at least, among a dozen men in one group shot (see here). As covered here, the scene including Rihab Allawi (the one woman in the portfolio) shows more 215 victims numbered 2916, 2920, 2922, 2924, 2925, and 2935 (Rihab), besides others that aren't readable. So even if the jailers know in advance when the prisoners will die and assign numbers that way, still they're numbered by death order, just predicted. Of course, that's not likely, so ... it's probably a simple order of death or perhaps order of counting among found dead. In fact, the SNHR must realize this sequential grouping even as they argued against its implication. When noting how different branch victims were present at the same time, they note one victim each from 215 and 216 are seen in the same photo, along with 227 victims #2076 and 2075. So clearly, it's not their number when alive, as someone told them. Each murdered detainee was given two numbers with only the intelligence service knowing the identities of the corpses. The procedure for documentation was that when a detainee was killed each body was given a reference number which related to that branch of the security service responsible for his detention and death. When the corpse was taken to the military hospital it was given a further number so as to document, falsely, that death had occurred in the hospital. So the prisoner number they had when alive remains a coded secret. Or maybe it's non-existent. Human Rights Watch heard both versions. To their credit they noted that fact, and leaned towards agreeing it's a post-death number. Their report (page 34) calls it a "detainee number: a number assigned to each detainee by the security branch that holds him in custody." When is it given? "Given that most of these numbers appear chronologically, it is likely that the number was assigned to the detainee following his death." This plainly evident truth might be why one "defector who served as a guard at a security branch" told them the number was assigned when someone died. But HRW also heard - from the central expert, "Caesar" himself - the same thing SNHR heard. He was speaking to the UN Congress in July. (HRW was unable to get their own direct interview with the defector, while the SNHR was. He might be going into more of a retirement mode these days.) "Caesar testified that the number was assigned at the time of the detainee’s arrival at the security branch." In all his careful observation, did the heroic whistle-blower never notice how consecutive numbers kept appearing together? Or did he think they were being killed off in the same exact order they came in? If so, why did he never mention that chilling - and fairly absurd - detail? المعتقلين ليسو أرقام - الصور المسربة (Detainees are not numbers - pictures leaked) uploaded by SAFMCD.Com, June 28, 2015. At 2:30, boy victim #216/85 is used to explain how branch victim # is "the number of the detainee in the intelligence branch before his murder." (emphasis in narration). Then they launch immediately into serial error and the upside of this call - "serial murder." They show yet another group shot with 215 branch victims numbered 2173, 2175, and 2177 (video still at right). The British-accent narrator explains "the numbers of the victims are consecutive or very close in sequence. This confirms the systematic murder process of the detainees." It's not just systematic but hyper-systematic and bizarre - it would confirm they're being killed just about exactly in the order they came in. The video also considers decay, slimy and otherwise, as caused by torture with "strange materials" (6:48). To them, this may help explain why decayed bodies are often numbered right next to freshly dead people. Here's one example of that: branch 251 victims 63 (freshly killed), 64, 65, (dead a week), and 67 (recent kill). I can't find 66. It might be one of the thousands that are missing, or one of the few in this stretch that's out-of-sequence. Note: Mouaz Moustafa is a member of this SAFMCD and is also, usually, the public translator for "Caesar" when he appears. No wonder they both seem to believe in this absurd reading. Moustafa is also a Syrian-American, not a Syrian, working in the "Government Relations" industry in Washington DC, a John McCain-affiliated director of the "Syrian Emergency Task Force" team pushing for the overthrow of Syria's government. They do this with reasoning and moral pretexts improvised from truth, lies, or whatever they find. Here he is giving a guided tour of the photos to Dubliners who seem to me more skeptical than he realized. Hospital #: Final Index for Retrieval? My guess is that there's a detailed file associated at the branch for each of these unidentified victims, accessible by that number. Or, if the branch part is fake, the file is at the hospital, attached to the bottom number (or the real hospital number if these too are faked). After the cataloging wherever, I suppose the bodies would be buried in a government-run cemetery, as "Caesar" and the rest claim. If there's even a first stop, then in between I'm guessing there's a last stop and final audit. Bodies would be documented one last time, correlated with any prior numbers, and gathered in sufficient numbers to justify a trip to one of the cemeteries north of town (or wherever exactly they were buried). And this is military hospital 601, where "Caesar" worked. It must be noted that burial under a number system in a government-run cemetery doesn't necessarily mean mass graves or dumping secrets. In Muslim countries, it's a moral imperative to bury the victims in soil within one day of death if possible, even if they have to be exhumed and re-buried later. When morgues are full, there are hundreds more to refrigerate, families have a hard time crossing battle lines to come identify people, etc. one might have no choice but the proper one of storage in dirt. If finally someone comes in and recognizes a photo, they'll have these numbers and photos to follow. The Hospital 601 number should then be correlated with a grave site number, and should lead right to the victim's remains for reclamation, when that's possible. But that's just my guess. Most people accept that these numbers are to verify the regime's evil plans were carried through, to conceal original prisoner identity, and launder their deaths as "heart attacks" at the hospital. As evidence for that, I believe, "Caesar" produced one or a few death certificates for heart attack victims he swears were actually among these 100% torture victims. And they might well be - several combat death, a couple natural causes, and mainly executed detainees - of someone. Considering the observations above, we should see on the victims and their index cards two different death numbers, ostensibly from two different facilities both recording the fact. HRW's report relates on page 9 how the first number is written at the security branch: "Former detainees reported seeing numbers written on the bodies of dead detainees or on cards, before guards removed the bodies from security branches." This is the supposed detainees - brought forth to confirm Caesar's story - specifying that the numbers were part of the broader system. From things they were lucky enough to see first-hand, they knew the numbers were not something, for example, that "Caesar" made up on his own initiative at the hospital 601 garage. Nor were they something official that was only set at the hospital. Nor, they're clear, does this numbering system document anything other than killed detainees. They're clear it all shows branch-hospital cooperation in mass murder and mass cover-up. The bottom hospital number would presumably be set at the garage, based on order of body processing there. So if what HRW heard is true, the numbers would be not just assigned but written in two different places. The blue ink lines on the hand holding the card in this SAFMCD photo from the 4-6-2013 folder. Cards and/or bodies are being at least partly filled in here, by these guys. It's probably the same color on that card, although it's hard to be sure with that deep blur. Also note it seems to be the same color of ink on top and bottom. That's consistent with just some writing happening here, and it's consistent with a completely on-site operation, as the witnesses were clear to argue away. Let's compare this to an unusual but instructive case. As listed in the SAFMCD database, victim 63 from low-kill branch 248 (military investigation Branch), in a folder dated July 26, 2013. This is a teenage boy who's been seriously starved, had his eyes damaged, perhaps chemically, his neck lightly burned/irritated, and has a trace of orange mucous/blood from his nose. Victims 62 and 64 and others listed near him show similar signs but in different combinations. Now see fuller view below (original - direct link, Zaman al-Wasl article). Seen: an unclear 4-digit number over 215 was first written on his chest, then mostly washed off and written over with 62/248. The card held seems to have agreed, originally, with the second number. But then “Caesar” changed the photo later, painting over the 2 and replacing it with a 3, so 63/248, as listed by SAFMCD (and there is a taken 62 slot, with no body shot to see if that was ever changed). Further, the bottom number was changed from 44? ?/b to 4450/b. The same color of blue ink was used on his body and for all numbers on the card, though possibly with two different markers at two different places. On the card, we can see possibly two types of handwriting, but the same color and gauge of marker at least. It's likely but not certain that everything here was written at the same place, perhaps by "Caesar" and an accomplice. In other cases, it may be different. * Branch 248 wrote ??? ?/215 on the boy's chest in error, forgetting who they were. Caesar corrected them based on the card they wrote saying 62/248, filled in the bottom number in the same color ink - but then decided later on that the original 62 he used to correct his other error was wrong (because?? ), and he changed it with after effects, besides the bottom number he threw off. * The branch wrote 62/248 on the card, and nothing on the body. Caesar goofed up the body writing and then changed it to match. The bottom number was filled in then, or was already done – but it was done wrong (?) and so he changed that in the photo, as well as the original 62. * Nothing was written at 248, if the body was even there. Caesar wrote this out for 215, maybe just by reflex or because that's all they were processing at the time. Then he realized some detail about the boy that, for whatever he knew about 248 and those running it, meant they should be blamed - or they were just short on 248 victims and he would be a perfect fit, or whatever. But he forgot there was already a 62, and had to change it later. And the hospital number, because that was 62's number. Did this boy replace an original 63 perhaps? * Caesar goofed this up on purpose, hoping someone like me would make a big deal over what actually seems to be an odd an isolated case. Well, I don't see a reason to make a big deal over this, yet - but it's confusing, and maybe eventually it will seem more important. And it was a good excuse to stop and wonder, which has been in short order with regards to “Caesar” and his claims. Update: An inverse example from the above. This entry does not show any number on the body but instead on forehead tape. It says 2008, with no branch specified. Someone clearly at the morgue and not the security branch goofed up the card to say victim and branch # 2008/b (again, /b was the morgue's running suffix at the time - the bottom number should be xxxx/b)). Only later did "Caesar" or whoever notice the error, and paint 215 over b. That seems reasonable enough, on a bad day...and it means in at least this case, the cards were being entirely written out at the morgue. If that were the case in the example above, if the boy had nothing written on his chest (only logical), nothing on his forehead as we see (or was that removed to aid the transfer? Ha! Look closely - there was tape there once. ), and he had no prewritten card (or it was tossed?) ... then what did Caesar use to correct his own /215 body writing error? An old example might help or confuse things here. Hamza al-Khatib was a plump 13-year-old or a plumber-yet full sized man, depending on if you believe activists and media or doctors and photos. He was famously killed back on the night of April 29, 2011 in Deraa, during torture in a prison or in clashes at the military housing complex, depending who you ask . He was apparently processed at Deraa's national hospital as an unidentified victim of the clashes, later identified and handed back to his family, according to official sources. But he was examined by coroner Dr. Akram al-Shar, who's mentioned in SNHR report as the head of forensic science at hospital 601 where the "Caesar" photos were taken. Thus they find him among the "most significant" of those "involved in the crimes." Note: according to the SNHR report, the biggest portion of identified "Caesar" photo victims - 204 out of 722 - are from Deraa. So a doctor, a number system, and a lot of victims allegedly link Damascus and Deraa throughout this story. A point that occurred to me later is the similarity of the forehead tape to a system I've seen used before - in rebel areas. This was the Ghouta chemical massacre of August 21, 2013, with hundreds killed allegedly by Sarin rockets (which is also just after "Caesar" fled Syria with his last gathered photos). Below is a boy victim, #86 (see also here), of a purported 800 numbered, unidentified victims, and perhaps zero that anyone knew immediately. (source f/c). Signs say that's because they were people held captive by local terrorist groups, who wound up burying them in mass graves somewhere, after a token few were claimed by alleged family on video. 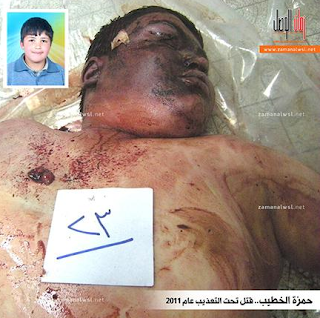 So here the tape records victim of (regime rocket? rebel prisons/gas chambers?). We know reels use this system, but it could be something everyone does. In the Caesar photos, we see the killers do the same, but with a branch number added beside it. Unlike the later victims, these were passed through the system as un-identified, or at least coded in a system very similar to that for mystery bodies; they get the official-style card documentation seen with little Hamza (left). Unlike Hamza (identified and then handed back to family) and the Ghouta mass gave burials, the "Caesar" photo victims had to be buried by the government in cemeteries they ran. Combining those precedents, this happenstance hybrid system could show a Ghouta-style mystery person - a victim of (regime prison/gas chamber? rebel prison/gas chamber? other/unclear?) - numbered like rebels at least do it, and then passed through the official system as well. In the example here, only a hospital number is shown, as with Hamza. In most other cases, the cards "Caesar" or a teammate write up "confirm" the branch number ... which was written there first by local terrorists, for all we know. The number system doesn't seem, in itself, to contain anything to undo "Caesar's" story. 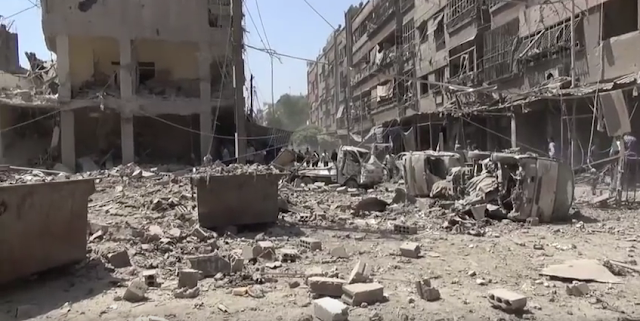 It could go either way in showing a seen 7,000, and implied 11,000+ men and boys killed in or near Damascus since the outsider-supported uprising began in 2011. The core questions remain when, where, how, and by whom they were actually killed. The answer to that is likely to be mixed, but we can't call it mixed/unknown and walk away, nor can we accept "Caesar's" claim these were all "regime" detainees. On this scale, with the horrible abuses seen, the proportions of the mixture must be carefully considered. And clearly the universal activist story of "tortured to death in a regime prison" has been highly overrated, from the little Hamza story up until now. After skipping a couple of possible entries, it's clearly time for Fail Caesar part four. Human Rights Watch (HRW) has finally investigated the alleged defector's dubious claims. Of course, they credit them, or the gist, and blame the government of Bashar al-Assad for systematic torture and killing of mainly non-violent detainees. Their December 16 press release, filed from Moscow at the start of Syria peace talks there, links to the PDF report (download page). The HRW investigation adds at least one useful detail to the emerging subject of the "Caesar" photos. I have yet to read the report, but thanks to the quick work of Human Rights Investigations (HRI, no relation) (see here), I can see what seems to be a major shift in the story that could and should alter the mainstream's understanding - but probably won't, at least without some prodding. This comes from HRI comparing the report to the early 2014 original "Caesar" report, done by Carter-Ruck law firm (C-R) on order of the Qatari royal family. This first report claimed "some 55,000" photos (rounded off), in two halves. They say "twenty-six thousand nine hundred and forty eight (26,948) images were present in various folders on the computer where the images were examined." These were Caesar's stash, that his story applies to. In all, approximately fifty-five thousand (55,000) images have, to date, been made available outside Syria by these processes. ... As there were some four or five photographs taken of each body this approximates to there being images of about eleven thousand (11,000) dead detainees. Hence, the oft-repeated 11,000 killed prisoners claim. The report focuses on 28,707 of the photographs that, based on all available information, show at least 6,786 detainees who died in detention or after being transferred from detention to a military hospital. The remaining photographs are of attack sites or of bodies identified by name as of government soldiers, other armed fighters, or civilians killed in attacks, explosions, or assassination attempts. Consider Michael D. Weiss, who tweeted "Here is @hrw's report on systematic torture in Assad's dungeons, corroborating some of Caesar's evidence." (emphasis mine) As I responded there " Just a bit over half of it, huh?" And the other half still sits beneath all the questions raised so far about "Caesar" and his explanation for all these deaths around Damascus. Now it sits with the knowledge the other half of the big lie is already proven (or so it seems, review pending...). The question then: is "Caesar's" story half true, or is it all lie? HRI (who first noted the discrepancy), asked the Carter-Ruck report's authors about this, but got no immediate response, naturally. Even given all the time in the world, they will likely not bother responding. They did their job and caused more problems for Syria, they got paid, and now they're done with it. I'll start here with the issue in graphic form. First note: it's not clear how HRW learned what C-R's "similar images" show, who told them, who they asked, etc. Maybe most important, it's not clear (yet) whether that's a final answer or an "at least" number from an ongoing process bound to get worse for "Caesar's" credibility. I'll have more text at least to add soon, related thoughts, observations, maybe news or new facts. I also intend to review the report, and I'm accepting comments. So HRW finds nearly half the photographs show of "attack sites ... or civilians killed in attacks, explosions, or assassination attempts" and of "bodies identified by name as of government soldiers" or "other armed fighters" (probably meaning NDF or "Shabiha"). This sounds like a system documenting mortar attacks and assassination attempts, at sites across the city, and blown-up victims, and slain pro-government fighters, likely also killed policemen, etc. This half, if not the other, sounds like a morgue documenting all the dead in a complex war situation than a holocaust machine snuffing out prisoners in the thousands. And both sides in the "Caesar" photos debate have previous hints this is how it would at least partly turn out. "Caesar" himself had said ... "I had the job of taking pictures of all the deaths ... before and after the revolution.” (al-Arabiya) But we were to understand he only smuggled out photos of bodies in the secret prisoner-elimination program, and avoided the temptation to pad it with pictures that didn't belong. The Syrian Ministry of Justice provided the one specific official refutation I know of, early on is 2014. As China's Xinhua reported, a MoJ statement called the report "baseless," and said it was "politicized and lacks objectivity and professionalism" and that Carter-Ruck "is clearly linked to hostile sides to the Syrian Arab Republic since the beginning of the crisis in Syria." Further, "The ministry added that the report was published two days before the Geneva II conference, undoubtedly proving that it has a political aim and tried to undermine the efforts exerted to realize peace in Syria and end terrorism in the country." "The report is a mere gathering of photos of unidentified persons proving that a number of them are foreign terrorists from several nationalities who had been killed when attacking the military checkpoints and civil institutions," the statement said. "Part of them are civilians and military personnel who were tortured and killed by the armed terrorist groups because of their support to the state," it added. - Clearly, a mere gathering of unidentified people can't include the second group of identified victims. He means a mix of foreign fighters and their victims. Also, un-mentioned, Syrian fighters should be in there too. - I haven't seen any proof or good evidence any of these are rebel fighters, Syrian or foreign. It could be, but maybe MoJ was just making a general propaganda point and not a specific claim. - Iit's odd how people being unidentified can prove they're from several nations - though it might suggest they're foreign. - The same goes for the other part - "civilians and military personnel who were tortured and killed by the armed terrorist groups" for being patriotic citizens. That could be, but this is also a frequent talking point; it requires no new facts to bring it up again. But note HRW is clear all "other half" civilians were killed in attacks and blasts, not after any kind of detention or torture. They want us to understand all of that happens only in security forces prisons. Update 1: Half of the Main Half Missing! Update, January 18, 2016: After some serious review of the numbering system, I can verify about 6,700 victims seem to be shown (6,850 photos - how many duplicates is unclear, but seems low). And I agree with SAFMCD and HRW that the increase and re-set of hospital numbers seem to support the claim that more than 11,000 bodies passed through hospital 601 That is, if they're legitimate numbers, which isn't certain. Now that I can see that, it's worth pointing out the obvious implication of that. 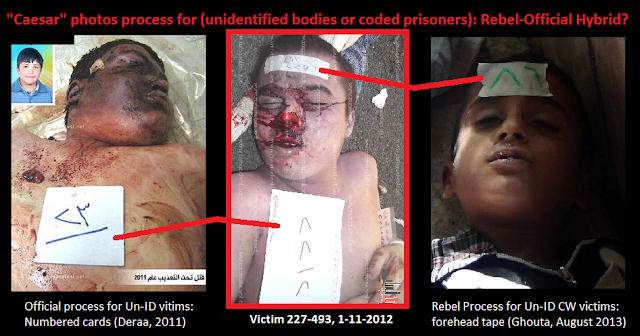 The main half of bodies - allegedly 100% tortured detainees - is only half shown (app. 60%), while approximately 4,300 images - 40% of the implied total - are missing somewhere in the sequence. Just where might become clear enough to call, in time. Were these just the 4,000+ detainees that came through on "Caesar's" days off? Or filtered-out pictures that didn't fit his story? We don't know what's missing. Famous civilian opposition leaders? Famous government supporters, retired officers, etc.? Soldiers and rebel fighters and foreign terrorists killed in battle? Massacred women and girls? Or as we're to presume, is it more of the same - 100% tortured male detainees of the Syrian government? The mentioned "other" half of the photos, showing the aftermath of rebel violence, have apparently not been shown. All unusual photos seem to connect back to entries in the main half of abused prisoners. That even includes this victim, an apparent NDF fighter ("Shabih"). He's tortured prisoner # j-9227 from the folder 4-6-2013. The numbers here agree. He's body #6441/b in the sequence of 10,000+ passing "Caesar's" camera. The "j" branch suggests he was taken out by Air Force intelligence, maybe for "refusing orders." He has Assad tattoos, a spiderweb on the shoulder, bearded but neat, and strong - not starved or anything, this one. He was apparently shot in the side by a large caliber round, perhaps by a sniper. Somehow he wound up here, identified just by a number. Does this mean he's another a coded state secret, or just that somehow he was hard to identify at the moment? However, the vast majority shown appear to not be combat deaths but captives - of someone. Several victims have pro-Assad tattoos, ones suggesting they're Shia (Shi'ite), or Palestinians (mixed loyalty there) and in one at least one case that the victim was a Christian. These and others are possible fighters for the government, but mainly they were not killed that way. They were captured first, allegedly by "the Assad regime" but often sporting half-healed wounds from the process. Then they were largely starved, and then finished off ... in ways that deserve more scrutiny. Another of the many men allegedly "martyred under torture in the regime`s prisons" and then identified from the "Caesar" photos is Mohammad Khaled al-Tout, (VDC English entry - محمد خالد التوت and Syrian Shuhada entry, citing that). He was a civilian, age 31, from Douma, Damascus - currently Islamist-occupied, but not so clear at the relevant time. Cause of Death: Detention - Torture. Date of death is given as 2015-03-10 but as usual, at least for the "Caesar" photo victims, they note the actual date is unknown - this is when they listed him, following identifications and media reports at the Ides of March. The VDC (Center for Documentation of Violations in Syria) explains "he was arrested in the 10th month in 2012 while he was taking his daughter to Jeroud hospital for treatment." What happened to his daughter isn't explained, but he was apparently held for 8-9 months and slightly starved by his captors. Other abuses include - at least - something that damaged or removed his eyes, leaving them looking black and burned red all around. This could be eye-gouging like so many photo victims suffered, something chemical like it seems many also suffered or - also common - both of these. This is according to the photo identified as him released from the file of "Caesar torture photos," with VDC's crop shown at right. The photo's caretakers at the SAFMCD have this entry, eyes blurred. 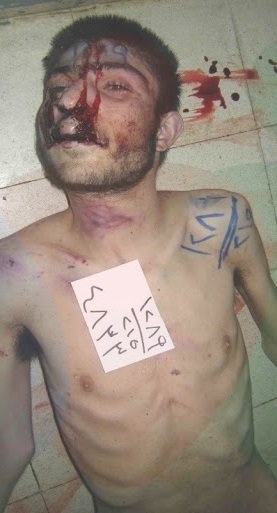 By the "Caesar" ID system, he's victim #2620 from Military Intelligence branch 227, "zone branch," documented in a photo in the folder labeled 7-7-2013. This should cover the span since the last folder (I've noticed) of June 24, presumably killed in that span (but really, any picture can be put in a folder of any name, metadata can be faked, and even that's missing here). Mohammed is a rare in being a "Caesar" photo victim identified as a resident of Douma. 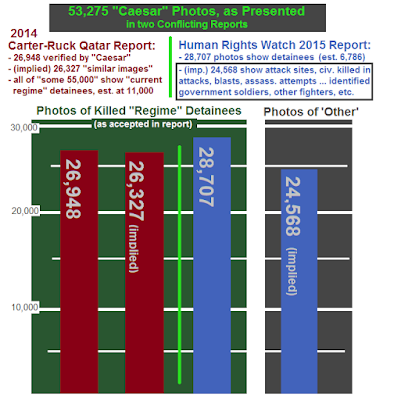 The SNHR collected 772 purported victim IDs "amongst which 123 victims were recorded in our database before Caesar’s photos were published." 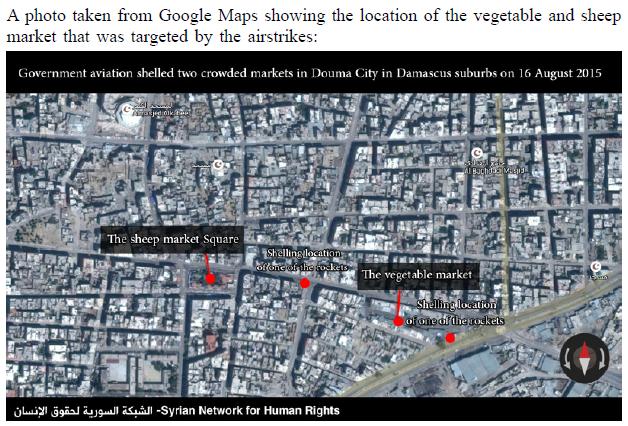 Only 4 of those 772 were from Douma, none of which they had listed before. (see PDF report here) And he was apparently the first one to be named; of 266 identified earlier, as listed here March 21 by Syrian Reporter, only one is from Douma: Mohammed Khaled al-Tout. It should be noted all names, there and in this post, including Mohammed's, are alleged. They're quite likely true, but possibly laundered to hide details that would mean something to those who know. But we'll just use the given names noting they may not be true. They're all where they should be, or accounted for anyway. Some disappeared but it's known where: regime dungeons. 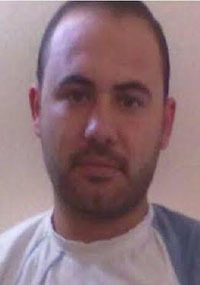 * Only one Mohammed: Muhammad Saleh al-Tut, from Douma, Detention Date 2012-05-05, but "detention date is inaccurate." It usually is, and that seems to mean these people were not reported at the time of detention but only later, often once they're killed. That's intriguing. These groups try to document everyone taken by "the regime," so vagueness like this is consistent with people taken captive by the rebel side. He's also in the "never came back" category: release date: 0000-00-00. This could be the same man later seen in the "Caesar" photos, if the arrest date is wrong enough in one or the other (May but inaccurate vs. October - and accurate? ), and if the middle name is wrong in one (Saleh vs. Khaled). That's possible, but more likely, this is another Mohammed al-Tout, and they simply did not list anything about the one's arrest, even though they later claimed to know when it happened. That's interesting. * Yaser al-Tout (not translated). Detention Date 2012-05-05. Release Date 0000-00-00. No further notes (even to say it's inaccurate). * Tawfeq Abdulgane al-Tout 2012-05-14 He was detained from his house. Release Date 0000-00-00. Aside from Hussam, all these men - like the photo victim under study would - have release date 000-00-00, never released, possibly killed but just not known, since it's deep in the regime's dungeons. 6 men listed as taken, most or all not released, in a span of 40 days. That's out of 10 listed all time. 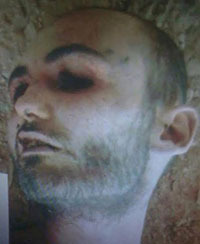 Another is a man named Ayman, taken earlier (Feb. 3). One listed later (June 28) is a presumably different Yaser al-Tout (but possibly a repeat). The other is a woman, taken later, maybe: Roqaya Tot, Detention date (2014-03-01) is inaccurate, she is detained with (her) daughter." The daughter may be listed, under her father's name (women keep "maiden names" here). Is this still regime forces, in Army of Islam-dominated Douma, abducting women and their daughters? 29 al-Touts killed (+ one Totanji) - 18 by "shelling" or "warplane shelling"
Of the 29 listed as killed, 3 are from Saqba, Damascus suburbs (both FSA rebels and a student). 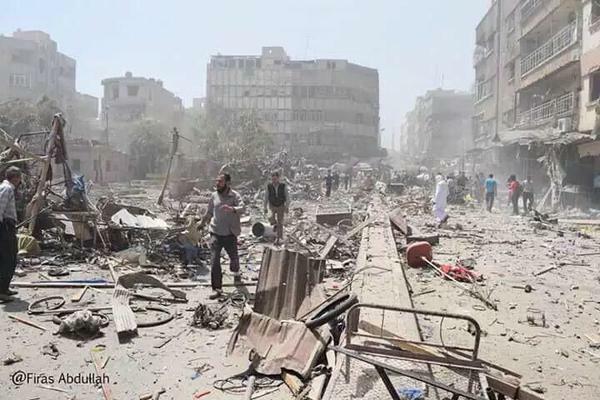 The other 26 are civilians from Douma. These include: a boy and a girl killed in a June 30, 2015 market attack, and a man and a boy (with a horribly burned face and oozing mucous) who died in the August 16 market attack (a proven rebel false-flag attack, apparently covering for a massacre of captives). Then 3 more children died on August 30 - a boy and 2 girls "due to the shelling." A man died in a 10/30 market attack, and another in December 13 from "air forces shelling with vacuum missiles and cluster bombs." Three men and seven children - this family bucks the usual trend of 90% male victims, doesn't it? It's almost as if someone had already chased off or killed off most of the al-Tout men they hated, and was whittling away at the rest. Otherwise, a civilian al-Tout man (hostage?) was shot during clashes with the Army (that is, as the army closed in on the rebel's location) in October 2015. And a boy starved to death December 3. Those who starve clear to death are more likely than not to be captives, deliberately starved. Further back, an interesting entry: "Abu Ahmad" al-Tout (VDC - Syrian Shuhada) was shot on or before October 5, 2012, and died then "Due to the injuries he sustained." That's the same month our subject Mohammed Khaled was reportedly arrested. Was this a second round of Tout-targeting that year? But Mohammed is the only one on the list given as killed by detention-anything. The 7-8 men, woman and girl detained ... none are listed as dead, yet ... but chances seem decent the men are also among the "Caesar" photo victims. In the days following the August 16 attack on markets in Douma, Damascus, I set to investigating the details behind the strikes, which allegedly killed over 112 local civilians. One question was where the attacks(s) occurred, which I explained - at first - in a cursory way, not thinking it would matter much. 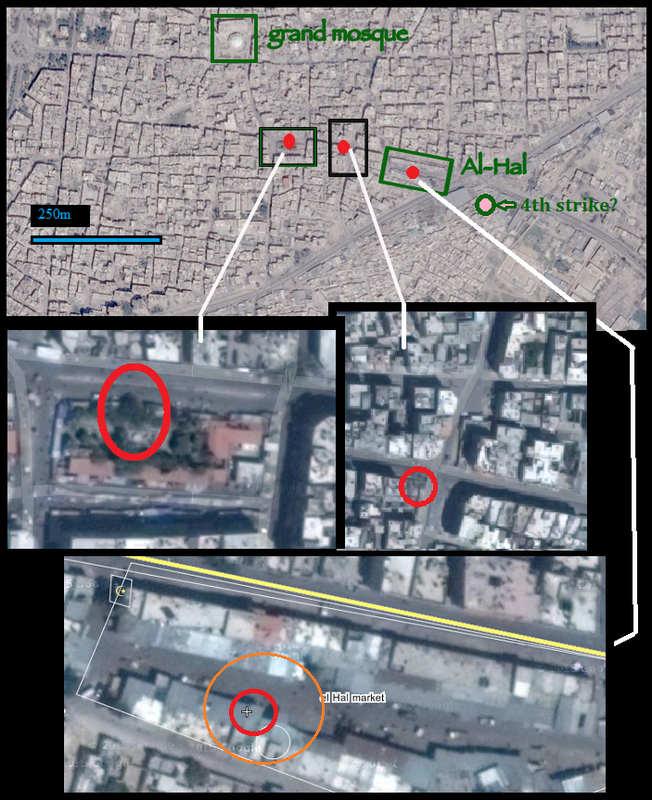 But since then, the apparent arc of attack emerged from that mapping and became, to me, the central point to start debunking this rebel lie (see one-month investigation review). An arc of attack probably means fixed-location, surface-fired projectiles, radiating out a set distance from the firing spot. In this case, it maps out to about 800 meters south of the impact areas (see below). And further, as far as I can tell, the projectiles were all actually fired from the south. 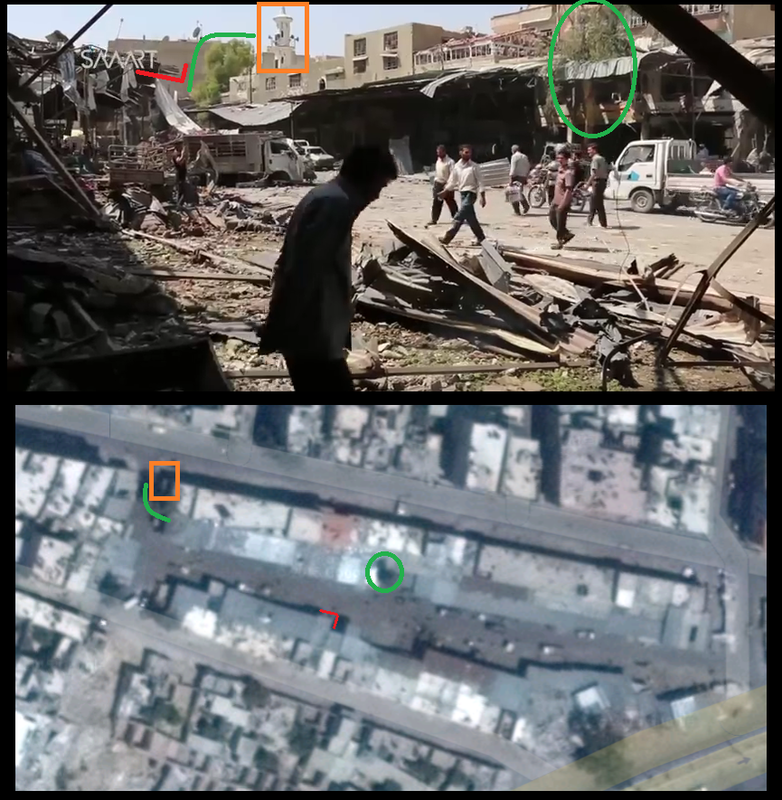 Rebels, of course, claimed it was a swooping fighter jet that hit these four spots in a rebel-held area. But that would almost surely look different. Its target might happen to lie in an arc pointing south, and it might happen to fire each missile in that pattern while swooping in from the south and no other direction. But the odds are fairly slim when the straight reading points to local rebels shelling their own areas, and when the motive for them to do that is so evident. Since it matters so much, and no one else has openly mapped the attack, a clear explanation also matters enough to re-trace the process more explicitly. This lets the reader verify as we go, or alternately to get a head start on spotting what - if anything - I did wrong. 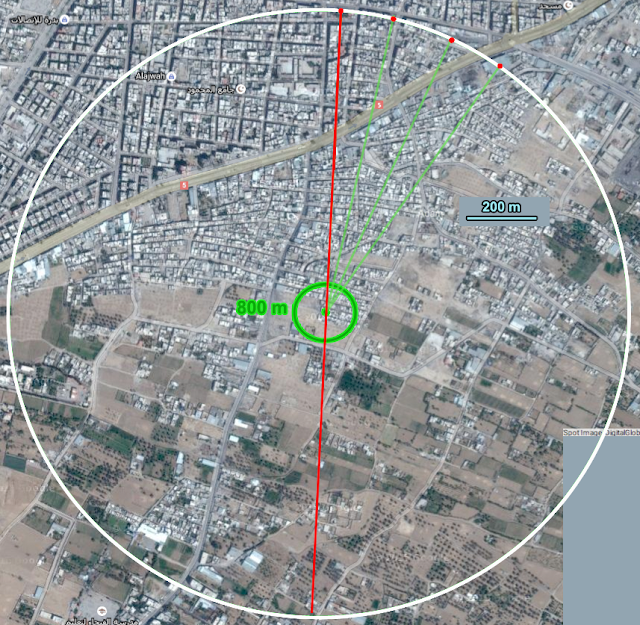 For reference, here's my current mapping of the four impacts, with the arc between them - partially wrapping around a firing spot some distance south - is quite clear by now. Area details for each give a preview with more detail below. Next I'll explain how these were placed and why it must be right in each case, along with some notes on exact impact point, apparent direction of fire, or other relevant details. That will be in order of discovery, which is also left-to-right as seen from above (as shown above). Anyone wanting to check the videos I cited, pull up the early video catalog I refer to here. This seemed quite locateable - the market scene shown in videos MD1, MD2, MD3, etc. The first two videos start coming from the north, by sunlight (mid-day, coming from roughly south). The effected area is ahead and to the right, and has a red-roofed covered walkway evident at the near corner, with a complex shape from there, a fenced-in park area it wraps around, a divided street to the north, and certain buildings in proportion around it. Here's a still of the northeast corner from MD1, park area to the right at and after the tall palm tree. First, I tried the Wikipedia shortcut, finding they have only two market areas labeled (in Arabic: سوق, Souq). One - commercial market - has a similar red roof, but not the right shape, lacking a park or right north-side street, and surrounding buildings did not match. Commercial market is irrelevant. The other market (el-Hal) was a clear mismatch for this strike, but is a match for impact 3 - see below. 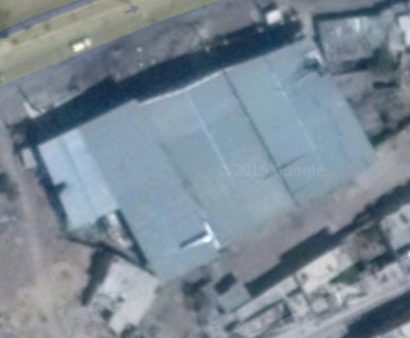 Scanning different satellite maps, I found only one other likely match in Douma, not labeled but here on Wikimapia. Here everything lined up. This was probably impact 1, strengthened to total certainty by the details of impact 2 (see below). One photo to help, at right (source), facing west down the divider in the street. Impact will be in the left-hand mid-distance. Direction of fire: The signs say, clearly in this case, that this rocket/missile came from the south. Here's another photo, usefully looking down on the site. Activists claimed these were fuel-air explosive ("vacuum") missiles, and that seems correct. Center crater can be seen (red circle), with the worst ground damage just behind it (seen from above, oriented north, as in bottom view). The fence ahead is obliterated (or may include existing entry). Wall behind damaged, mainly low. Red roof tiles blown or burned away. The tall palm tree's trunk is smoldering high up, ahead and to the right (green box). Considering blast damage slopes upward along direction of travel (partly explained below), these signs all say southern origin. Also, the damage area extending into the street seems to be elongated on the north-south axis, meaning that's its direction of travel. A rough measured line (bottom view) seems very close to me, and reads 181.5 degrees, or coming in from just west of due south. This is just about what to expect for an impact in the arc of attack that emerges. The videos MD1 and MD2 show both Park Market and the second impact in uncut footage, establishing their relation to each other in space. To the east one block from park market (see MD2, turns left = east) is the next strike at a traffic intersection. The cameraman walks past two minor allies but no streets between sites, so it's just one block. Several vehicles, including a Red Crescent ambulance, were flipped over here, and a smaller building or two were flattened. Videos MD4, MD7, MD10, etc. also show intersection footage. Still from MD10 below, facing west from the middle of the intersection. Video MD4 (Jabhat al-Nusra stamp) shows a view to the north at 0:14 (still below). Here, the north-running street seems to end, a low building cutting it off about one block north. The map shows just that; the street wiggles around the building. (see graphic below). Other surrounding buildings match up. And as noted videos show this consistent area is consistently one block from another consistent area. The two bolster each other as 99.9% certain, and a core geolocation upon which to base the next two placements. Exact center of impact: Satellite views suggest taller building (4 stories +) dominate except right at the southwest corner, where lower buildings seem to have existed. Now that corner is rubble, with the tall building all still intact. This gives a narrow area for the impact (blue box in graphic below), but exact spot within it is harder to say. Left-hand view below suggests it was south of that wall damage (orange line), so a bit south of center within that area (green circle). Purple lines here mark app. real footprints for the taller buildings (roofs are skewed relative to the ground) Orange lines left and right are explained next. That was one estimate, and bound to be close. 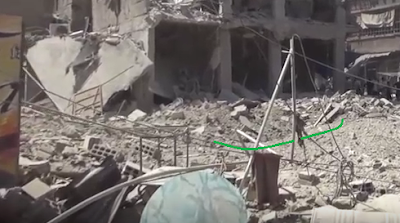 Then I saw video MD4 actually shows a likely crater, almost the size of this green circle, but centered just a bit northwest of this, closer to the tall building. At right, a clear still with the apparent crater edges outlined in green. It may be even bigger, continuing to the left, or that may be the edge of it there. Direction of fire: not clear, but perhaps also from the south. Surrounding building damage: to the left side (left, below) is severe and probably fresh - a line of damage (orange) sloping up to the north. On the right side, the same basic lines, but further out, and only marked by small shrapnel - more likely to be preexisting damage. But either would suggest, like the park market impact, a southern origin. Here, see the red line, approximate incoming angle - the blast effect radiates perpendicular from the explosives packed tightly around and moving on that red line. That's why low damage behind sloping up to higher damage ahead is the rule.2:38 in MD1 shows damage ahead, to buildings north of the intersection, with distinct shrapnel-type marks arcing across the third and fourth floors. Vehicle flipping happened to the north and east of impact, but then, that's where the streets are. Rubble spread may be mainly to the north. These details could all use more study. (or al-Hal - a general type of (Hallal?) market) El-Hal market on Wikimapiua is a long open area running a bit clockwise from east-west, enclosed on both sides by buildings with awnings. This is consistent with videos - the buildings aren't homes, except maybe at night - they're open-faced, like giant vendor's stalls. Heavy duty carts, scales, trucks are here - unlike park market, this place deals in serious volume of food, most of it seeming to be tomatoes. Confirming view: (SMART news, video MD13) has this view to the northwest shows an apparent minaret at that corner of the market area (orange box). 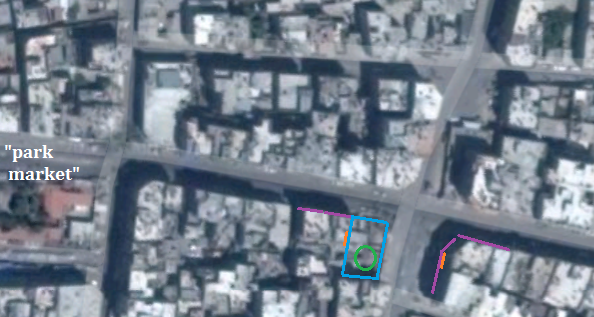 No minaret is clear in satellite views, but Wikimapia labels a small mosque right there at the corner, next to an extra large tree (green arc). Also note the unique tree "growing through" the awning midway along the north side (green circle). All unique features match. Impact location: so far I don't see any crater or certain way to get an exact center. However the damage - which appears very minor - seems to start around the center of the south side awning, around the corner marked in red - likely on the smaller section of awning that may now be gone (not clear). A truck near there almost seems to have taken the worst of the damage, being sort of crushed in from all direction ("vacuum missile" pressure wave? Is that what bent the awning so uniformly at the tree?). Direction of impact: not clear from imagery alone, but perhaps also from the south or south-southwest. Note the tree trunk on the north side, just along the likely trajectory, is only damaged a bit on the top, trunk and canopy both apparently unburnt. Again, blast damage - or the radial part of a FAE detonation - will angle up based on incoming angle, enough apparently to pass mainly over the tree. Only minor damage can be seen to the buildings behind the treetop, so maybe they too were short enough to escape the worst of it? Damage to the ground should be expected mainly behind impact, closer to the south side if fired from the south. But nothing is really evident. Perhaps one now-destroyed patch of canopy detonated the blast high up before the spent rocket hit the top of that truck? It would detonate over a short span of travel, between the canopy and the ground. That plus the rising forward angle could explain the lack of damage on the other side even high up. Original sources had 3 markets hit and the above list only has two. Quite likely the last will be another market. None labeled, at first no site visuals. Southwest views analysis showed the four plumes lined up so the three on the left correspond to the three above, and strike 4 must be to the east of the others. The already-evident arc pattern and even spacing suggested the large building just southeast pf El-Hal - massive warehouse, with enclosed lot similar to el-Hal... best guess, pink dot placed, imprecisely, in this version of the evolving map (right). It's not labelled, but would make a good farmer's market, if El-Hal weren't big enough to meet local demand. 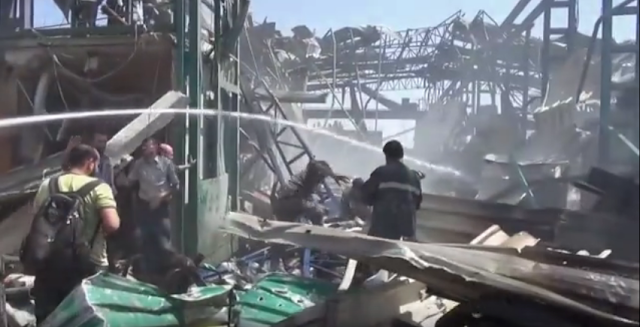 Then Petri noticed a matching snippet at 0:30 in this video (MD10 on my list), suggesting this site (see still below) - a massive steel framed building with light roofing torn away, corrugated metal siding and damaged frame members, fire inside being extinguished, one mangled body being recovered at the moment. The near face, apparently the southeast one by sunlight angle, has giant green doors. Historical images in Google Earth might show these just left of center in the center part of the building, but it's unclear. Note the roof peak here - that would mark a peaked line running northwest, as the satellite views show running across the middle of the building (it's a mild peak, sloping less than the separate roof segments over the north and south ends of the warehouse - see shadows below, clearer in some historical views). So this rocket hit the building's expansive roof - just where unclear, close to "the middle," perhaps a bit southeast of center. The damage seen above is hard to call - we can see the center peak, but not whether the damage is worse on this side or on the far (north) side of that line. An even 155 meter spread would put it about south of the line, so that's where I put it in the graphic above, but really that point is uncertain. - There's an even spread; each impact is approximately 155 meters from the last. These are the measures I got (measuring along each white line, not along the top), again each placement is not exact but accurate to probably a few meters. - It so happens three different markets (each one being a large target) plus an intersection had enough points that an even arc like that could easily hit all three markets with no fancy variation needed. - Once mapped out like this, I can measure a full 33 degree spread between impacts 1 and 4, or 11 degree turns between each firing. That's not any fancy variation. - Considering motive and local control, this simple firing was almost surely by someone on the anti-government side. 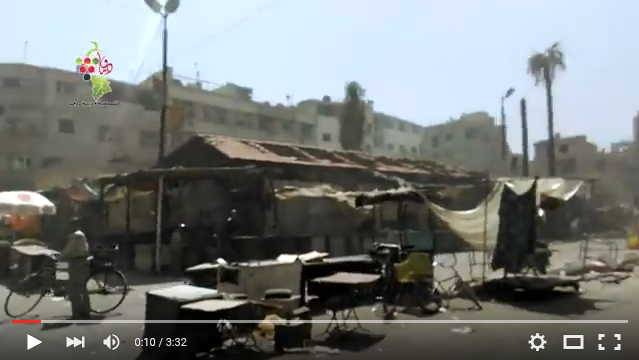 They fired four times in a row on civilian markets in their own area, apparently to cover for the massacre that had just been carried out there (established as happening before the attack) and - pretending this was a Mig fighter jet attack - to launder it as a regime crime. And the pattern makes it clear this was no accident - those were civilian targets, 4 in a row, and that "fighter jet" was quite deliberate in its intent to ... explain a bunch of dead civilians. Do Rebels Actually Agree With this Mapping? 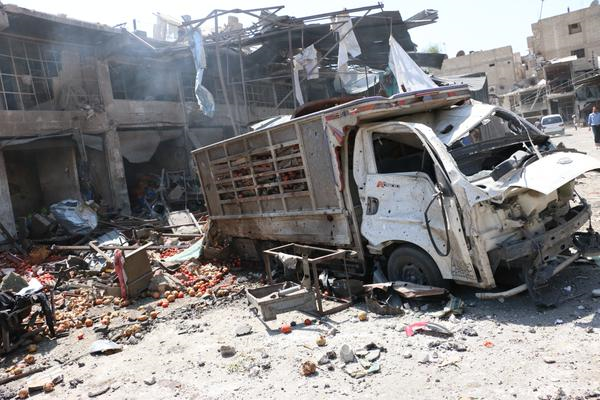 The usual anti-government activists and local "authorities" told Human Rights Watch (Aug. 20 article) that "the four airstrikes hit the crowded markets, known locally as the al-Hal, al-Houboub, and al-Ghanam markets, at about noon. All three markets are within 500 meters of one another." That's almost exactly the span of this area of 3 markets and a fourth impact. They trace about 600 meters of their arc, but a straight line east-west from park market to north of impact 4 is just over 500 meters. We're all talking about the same area here. They say a Mig jet hit these four spots, but they didn't map it out (nor did HRW, publicly). But I did, and it virtually proves they lied. Other than the last one, they map it about the same as I did, and just don't care about or realize the implications. The second impact is also a bit different here - rounded off to at the intersection, but on the right corner anyway. My placement a bit south of there is more accurate and clarifies the arc. The last hit they're clearly wrong about - it smashed through the roof of that building, just like the arc predicts. "Park market" here is sheep market. I don't see where the sheep were supposed to be, nor any sheep. The one they got wrong, #4, seems a best fit for selling livestock, right? Human Rights Watch (Human Wrongs Whitewash? ), hearing about the clustered impact areas but not having mapped them (or did they?) - called for an arms embargo on Syria, along with dropping hints that a Bosnia-or-Libya-style air war might help stop the suffering. I've alerted HRW's Nadim Houry at least: "would HRW endorse arms embargo on Syria over a rebel false-flag rocket attack from 800 m? Why should words trump science?" (tweet 1 tweet 2) And also the SOHR who reported this "official massacre" by jet, only to be proven wrong: "Alert: as you may know, your remaining activists in #Douma are no longer credible." (tweet). No response from either. No retractions and no counter-arguments are expected.